You may find below answers to your queries with regards to Chinese Medicine. Please feel free to contact us to discuss any of your concerns. Chinese Medicine is the oldest form of healing known to mankind. All the treatments are natural therapies and all medicines are found in nature, making Chinese medicine the world’s oldest, safest and most natural system of medical care. Chinese medicine is a truly holistic form of medicine and it aims at treating the whole body rather than just the symptoms. It emphasizes the body as a whole, concentrating on strengthening the patient’s own immune system and corrects the imbalance of the internal organs. HOW DOES CHINESE MEDICINE COMPLEMENT WESTERN MEDICINE? Due to the nature of medicines used, western medicine is more effective on acute symptoms while Chinese medicine is more effective on long term illness. With certain conditions where western medicine fails, Chinese medicine has its most effective results, with complete cures being common. On appointment for consultation, the doctor will examine the patient utilising traditional techniques and will consult with the patient on present and past medical conditions and lifestyle. Then applying the principles of traditional Chinese medicine, the doctor will recommend a course of treatment to relieve the condition if possible. WHAT IS INVOLVED IN ACUPUNCTURE SESSION? Each treatment consists of a number of fine needles, usually 6-15 being inserted into specific locations of your body for 15 to 20 minutes, according to your presenting symptoms. These bring about changes in the body to restore health and vitality. Most people experience a feeling or peace and relaxation during the treatment. You should be fine to travel home alone afterwards. If you are in any doubt, you could take a friend with you on your first visit. Generally speaking Chinese medicine is safe with very few side effects. Occasionally, because the body has to re-adjust there may be some minor side effects, such as loose stools, or diarrhoea, of which you will be informed beforehand. HOW DO I PREPARE THE HERBAL DRINKS? Please download the document explaining how to prepare your herbal drinks. If you have any further question, please contact us. WHAT ARE OUR PRACTITIONERS' QUALIFICATIONS? 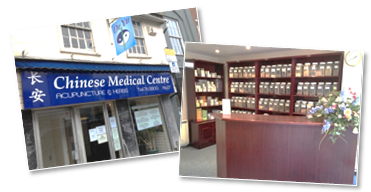 All our practitioners are fully qualified Chinese medicine doctors from China. They all have five year university medical training and are registered with the appropriate Chinese and British medical institutions. Please find out more about our practitioners here.